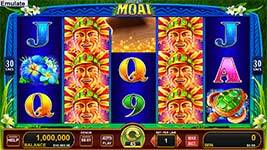 Explore the secrets of Easter Island in the incredible new Great Moai online slot by Konami. This 5-reel slot has 3-rows and 30-paylines that offer a rewarding RTP of 94.08%. Turn up the dial on the treasure hunting adventure with Action Stacked Symbols and bonus features like wilds, multiplier moai wilds and a free games bonus! Wild Symbol – The mighty Moai are the games wilds and substitute for all normal symbols in the game. The 2x multiplier Moai substitute for all symbols including the normal Moai and have a 2x multiplier applied to applicable line wins. Moai Wild Feature – Randomly, extra Moai and 2x Moai symbols appear on the reels during or after the reel spin. Action Stacked Symbols – Each reel contains a number of adjacent positions that are randomly replaced with one of the game’s normal symbols before the reel spin is initiated. All replacement positions are filled with the same symbol. Free Games Bonus – Land any 3, 4, or 5 pink bird symbols to trigger 8, 12 or 20 free games respectively. The wild feature can occur frequently during the free games.